Much has been written about the Supply Chain talent shortage, but not the various aspects of Supply Chain like procurement, sourcing and supplier relationship management. As these areas continue to evolve to more “value contribution” organisations, so too must the people skills evolve. Below are some thoughts on the skills required to move the Procurement organisation to a valued business and Wall Street performance contributor in the next few years. 1. 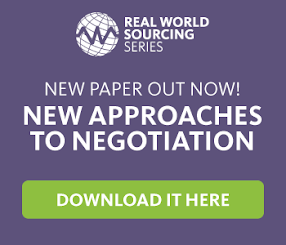 Analysis of a multitude of data is required to make the most informed sourcing and supplier relationship decisions. Optimisation technology will assist to shorten the supplier selection time, reduce risk and secure margins, but analytical skills will be needed to look beyond and strategise the future. 3. Supplier relationship management skills are a must. You can’t have great products without great suppliers focused on delivering value. It isn’t just about the transaction and quickly picking a supplier, it is about a focus on the value generated from the supplier to the product and ultimately into both companies’ revenue stream and profitability. 4. Financial acumen or the ability to look at the whole financial picture with a variety of factors and constraints, harnessed into the right decision that continues to deliver to the top and bottom lines for sustained growth. 5. Leaders focused on the business strategic plan with an integrated business plan that delivers the numbers required to make the business success on Wall Street. Are you taking a slice of the ‘Bread of Heaven’?